The Enterprise finds another Constitution-class starship, the Defiant, adrift. Once aboard, it appears that the crew murdered each other. The Defiant itself seems to be phasing in and out of existence. Captain Kirk stays behind to give the rest of the away team time to escape the Defiant as it fades out of this dimension. Now in command, Spock believes they have one chance to save the Captain, but now standing in their way are a new enemy, the Tholians, and a powerful weapon. Will the Enterprise find a way to save the captain and themselves? I don't know how to save him, nurse... there's no place to tear his shirt off! Kevin: We get another introduction to the idea of other universes and the ability to travel between them in this episode. It would have been easy enough to just make the ship blink in and out of existence for some reason, so I like tying it in to previously established science fiction ideas in the show. Matthew: What I like about this episode, science-wise, is that it posits an interesting mechanism for slipping between universes. Our previous two excursions, "The Alternative Factor" and "Mirror, Mirror," were a little fuzzy on how it happens. It was too easy in Mirror, and it was kind of odd and weird in Alternative (the minus-world Super Mario portal). Here, it's described as an area of space that intersects another universe that is weakened by high energy exchanges like propulsion and phasers. Makes sense to me! No, really, it seems more reasonable than the other explanations. Kevin: We get another example of Spock in command and having to fight the emotions of the crew. This is probably its best example. The high tension and snapping is appropriate given everyone's grief, coupled with the deleterious effects of the space they are in. Unlike, say Galileo Seven, where the insubordination ran a little too hot a little too fast, this felt perfectly pitched. One of the most touching moments in the series has to be McCoy and Spock listening to Kirk's final orders. Shatner did a great job from a voice actors standpoint, and he so beautifully summarized what he found in each of them, and thus what they could find in each other. I also enjoyed that neither would admit listening to it at the end of the episode. Matthew: Definitely a great scene. Kind of reminiscent of "The Immunity Syndrome," in which Kirk must choose between Spock and McCoy to fly into the space amoeba. As in all instances of exploration of the main triad of characters, it is always best when there is tension but also love. Spock and McCoy are friends, but their very different personalities are frequently at odds, especially as you say in this hairy region of space. Their reactions to the advice are written perfectly as well, a credit to two first-time authors who get the characters right on the first try. Kevin: The Tholians were a neat enemy. The faceted crystal structure of both the alien and the ship was cool and it ties into the lattice structure of the web. I will say this part of the episode caused some pacing problems. Also, it seems like an overly complicated weapon. It takes forever to set up. A ship vulnerable enough to get trapped in the web would have to be pretty easy to destroy or traditionally tractor. Still it was a neat-o effect. And the tension and energy at the end of the episode when they escape the web and save the Captain was top-notch. Matthew: Pacing was the real Achilles' heel for me in this show. The last third until the rescue really dragged. I also didn't like how the transporter broke at the most inopportune moment. The logic of how and why Kirk would still be alive was a little shaky, as well as Sock's seemingly immediate knowledge of how this interphase would transpire. Also, why would space suits only have 3.62 hours of breathable air? It's the future, after all. I'd expect at least a day. While I liked the scene in which Scotty wonders whether the antidote (which looked a lot like "Tang") would mix well with scotch, it was kind of out of place in terms of the timeline of the show. Maybe he was just taking it to engineering to administer it to his crew. So, now that I've criticized the episode, how would I have done it better? Well, I think that you could have some scenes of Kirk in the alternate universe, alone. I wasn't really clear on why Kirk was ever separated from the Defiant, but let's say the explanation is that the transporter beam ripped him away from it. So we cut from the scenes on the Enterprise and we find Kirk drifting in an eerily different deep space. Then he sees the Defiant a few hundred Km away. Perhaps we have a voice over from Kirk, maybe even a Captain's log (assuming the suits can record them). He says he is seemingly alone in this strange universe, and that the only possible hope he sees for getting back is getting to the Defiant and using its equipment, if possible. But the environmental suits they have do not have rockets for maneuvering. So he must expend some of his oxygen through the valves, using the thrust to reach the Defiant. This is why he only has 3 or so hours left, though the Enterprise has no way of knowing this. Perhaps all the atmosphere leaked out of the Defiant while the ship was phasing. 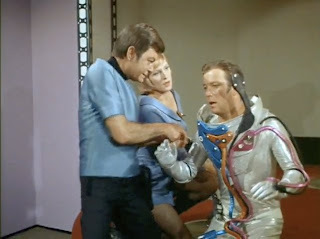 A scene unfolds in which Kirk engages in the delicate process of retro-thrusting his way towards the Defiant, and then entering through an airlock (maybe using a special code only captains know). Then, upon the Defiant, he uses the equipment (you know, with treknobabble) to send images of himself to the Enterprise, but he can't get them to the right spots, easily. So Uhura sees him, Scotty, etc. Finally, the Enterprise figures out how to get him, but they see that Kirk is struggling for breath. OK, so that was a long digression, but I think it could have been done with little extra budget outlay (an airlock set, basically just a door) and it could have solved the pacing issues entirely, plus given us a really cool airlock scene, a la 2001. Kevin: I have to say that I am intrigued by your ideas and would like to subscribe to your newsletter. Though, armchair directing could conceivably be a separate blog of its own. Particularly in regards to a certain film that won't be named. I would have been happy with any explanation for Kirk's appearances on the Enterprise, even something like the fact that he beamed in from the Enterprise somehow anchored him there, even as the Defiant drifted further into interpsace. The biggest benefit of a few scenes from Kirk's perspective would have been to break up the slow third act. Kevin: Seriously, Constitution-class vessels are f-ing cursed. The Constellation was destroyed by the Doomsday Machine. The Exeter crew was turned to crystals in "The Omega Glory." The Intrepid's crew were killed by the space amoeba. And the Excalibur was destroyed by M-5. I'm not saying it's not still effective. A mighty ship of the line floating dead in space is pretty disturbing. I'm just saying they better be getting some hazard pay. Matthew: So this makes 5 of 12 destroyed. But hey... "Risk... is our business!" Kevin: I'll say this. It really, really reinforces how capable the Enterprise crew is. They continue to sail through danger after danger, where other crews are annihilated. Kevin: Like I said above, the scene in Kirk's quarters was particularly moving and acted to the hilt by everyone. I also enjoyed getting to see Uhura in civilian wear, and you know, getting some lines. She has to pack a lot of emotion into a few moments, and I think she succeeded pretty well. Matthew: Nimoy gets the bulk of juicy scenes in this episode, and as per usual delivers with aplomb. His awkward funeral speech is a perfect Spock scene. The usually underutilized Nichelle Nichols does well, too. Doohan gets a few good lines, as does Takei. But they were not used to their fullest. Kevin: Recurring guest star Barbara Babcock did her usual fine job of metallic voicework. Kevin: This episode won an Emmy for special effects and deservedly so. Especially for the time and the budget, they packed a lot into this episode. The optical effect for the phased parts of the Defiant were nice and clean. 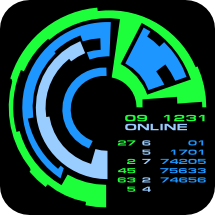 The Tholian ships and the web were both well done and visually really interesting. I have to single out praise for the space suit. Especially at the time, science fiction tended to gloss over environmental needs, or make the space suit just a big fish bowl on your head. The suits evoked the valves and moving parts of contemporary flight suits, while appearing more streamlined. And sparkly. Matthew: The use of the fish-eye lens to indicate disorientation/insanity was cool. Speaking of camera angles, we get an extended look at Chekov's absolutely awful comb over - it's coming from about 3/4 of the way down the back of his head. There were some very nice music cues in this episode, such as during Kirk's taped speech, Kirk's rescue, and when Uhura pleaded with McCoy that Kirk was alive. Kevin: This gets a four from me. The scenes around Kirk's apparent death are among the best in the series. It speaks to the power of the main three that one can be physically missing and still felt so powerfully in their interactions. The middle is a little sluggishly paced and the concept of the web a little to grandiose for its own good, and that keeps it from the 5, but don't take that as a dig. This was a great episode and a lot of fun to watch. Matthew: I'm wavering between a 3 and a 4. I think the pacing issues really cramp this episode's style, despite some killer scenes. Also, the fuzzy logic which put Kirk in the quandary in the first place left me a little cold. I think, in the end, had the good scenes been more original, I might go with a 4. But the funeral scene is reminiscent of "Balance of Terror," while the last orders/Spock in command scenes feels like they've been done before, too (Immunity Syndrome, Amok Time, Gamesters of Triskelion, Galileo Seven, Paradise Syndrome). So, I'm afraid I'm going to have to err on the side of caution and call this average, a 3. Had it been peppier, had they had one more startlingly original scene, had the supporting cast been given even more to do, it would rise above the median. But as it is, I think this is an enjoyable, flawed TOS show that falls squarely into the fat middle. So that's a 7 from the both of us.